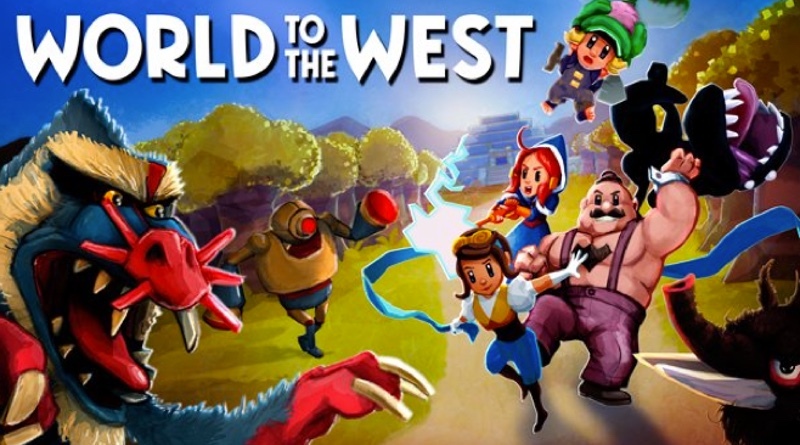 Set in the same universe as Teslagrad, World to the West is somewhat of a spiritual successor. The first game was a puzzle solving 2D platformer, whereas this one features a ¾ top-down view, reminiscent of the traditional Zelda games. You do eventually take control of a character that has similar magnetism powers seen in the first title, but overall this game plays and looks very differently, and that’s both a plus and a negative. The game’s world is setup in such a way that there are plenty of places to explore and secrets to discover. Many times there’s a huge door blocking your progress that will require a specific stone key to proceed. Other times you’ll encounter other hazards and obstacles that require specific powers of one of your four controllable allies. That’s right; in World to the West you don’t just play as a single character. You’ll gain access to all four as the story unfolds, and each brings a unique set of skills and attacks that can be used to solve various puzzles and reach new areas. For example, one of your allies will be able to use special powers to take over the minds of animals and creatures. Another can dig underground to bypass closed gates and reach areas others can’t. Each has his or her purpose in the game, and it’s up to you to figure out where and when to use each character to proceed. Most of the puzzles are easy enough to solve, but sometimes it can become difficult when you have to backtrack to grab an item you may have missed. In theory this game has some really good ideas, but the developers have failed to execute them as well as I’d have liked to see. There are many examples of where the game comes up short. Early in the game you discover these totem-like warp points that allow your characters to instantly zap from one part of the map to the other. This is complicated by the fact that each character can only warp from the gate they have discovered themselves, so you can’t warp one character to another unless they’ve both individually discovered them. On top of that, when you do warp the load times can be atrocious. Sometimes they’re quick, but other times I wondered if my Switch had locked up. Another shortcoming is that most of the characters and enemies remained uninteresting throughout. I get that this is a hard thing to nail and that this can be highly subjective, but I just found the game to be lacking any sort of charm or entertaining moments. Combat is more of a chore than it is fun. Games like Zelda really make battling enemies an enjoyable experience – so much so that I often seek them out instead of just bypassing them like I did in this game. That leads us to the presentation, which is very lackluster. In fact, it reminds me of something we might have seen late in the N64’s life or an early Dreamcast game. Most environments have a low polygon look to them and the characters are flat shaded and boring. The framerate is also an issue and I noticed the screen would slightly hitch when scrolling on frequent occasions. While the game isn’t overly ugly or anything, and I get that this is an indie game, it just doesn’t look that great. The colors and lighting and overall aesthetic just looks generic and uninspired. It’s hard to believe that this game was made by the same people as Teslagrad, which had some truly amazing artwork and beautiful backdrops. Luckily the game plays well and controls are spot-on. Also, I enjoyed the soundtrack as it gave the game more of a lighthearted vibe. I just wish the rest of the Word to the West were exciting and fresh. This is a perfect example of a game that’s not bad or unplayable, but doesn’t really set the world on fire with originality and lacks that certain fun factor that’s needed to keep players entertained. In the end, the game is competent and fans of the genre will probably find something to like here. Unfortunately it just didn’t click with me. World To The West is worth considering if you enjoy adventure games like Zelda. I just wish it had a more interesting story, better graphics, and wasn’t so generic in its gameplay. Some will find enjoyment here, but I wasn’t impressed. World to the West was reviewed using a final retail Nintendo Switch download code provided by the publisher.